I have always known that little things matter. Recently I’ve remembered that the little things often ARE the big things. After a week spent vacationing in the Whalen House in Grand Haven MI, my mind replays lovely memories. There were gorgeous sunsets, incredible views of Lake Michigan, and the red light-house just across the road from our rented cottage. All glorious, ostensibly big things. But what stands out two weeks later? Watching my eldest and his wife make soap bubbles with their nephews. Seeing the delight on my daughter’s face after she returns from geocaching with her boys. Sitting in the sand with my extended family, visiting while watching the grand kids build sand castles. Photographing little items that might be fun to paint, like the tea cup covered with clover decorations that I discovered in the living room. It will please the Irish in my family so much! Visiting over wine and pie in the “man cave”, a little hut outside the main cottage. Most of the things listed could happen anywhere. Often business encroaches on the important “little things”. Today I remind myself again to do better: listen more, send more notes, respond to emails more quickly, etc., because the little things really are the BIG things. 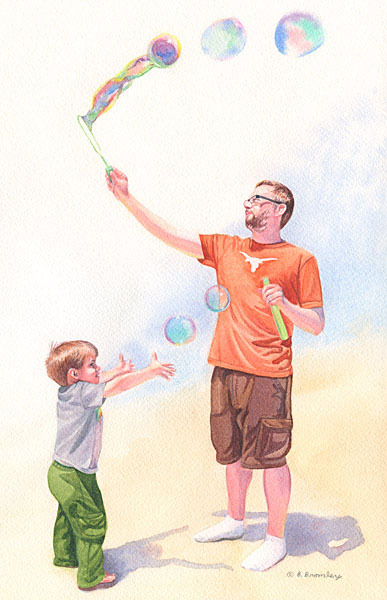 This entry was posted in happiness and tagged celebration, grandchildren, grandkids, Nephew, painting, passages, philosophy, soap bubbles, Uncle by artfulbarb. Bookmark the permalink. Grandkids do make appreciate the little things. Well said my friend! Thank you Janette! We really did have a lovely time. It was a wonderful vacation filled with a lot of big little things! We can’t wait to see you again! I agree! We really need another vacation. It’s so sad that work and money get in the way of travel!!! Life cannot contain too much joh. Thank you Eve! I miss old friends, think of you often, and even use the clay pots you gave me in a barter!